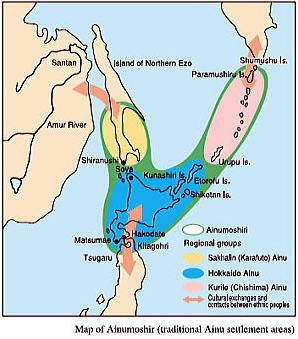 The figure below shows traditional Ainu settlement areas from approximately the 17th to the 19th centuries. The figure shows the confirmed settlement areas of the Ainu people. Needless to say, it is recognized that the Ainu people moved to neighboring areas and came into contact with people there. Furthermore, it is recognized that the distribution of place-names stemming from Ainu words covers an area a little larger than the traditional settlement area. However, the figure below omits some of these places because of inconsistencies, including the existence of place-names whose origins cannot be proven. Since when have the Ainu people existed and how did they live? Answers to these questions can be found in the chronological table of the Ainu history (outline) on the following pages. Unfortunately, many historical materials and records have not been examined from the perspective of their relevance to Ainu history. The role Ainu history plays in the larger history of Japan remains particularly uncertain. More detailed study of Ainu history is necessary in the future from viewpoints of archaeology, historical science, cultural anthropology and other sciences. Further, the implementation of education and enlightenment of the general population to accompany this is also an important task for the future. During the period from the Meiji era to the outbreak of World War Ⅱ, schoolbooks compiled by the Japanese Government described the Ainu as an indigenous people and all primary school students learned about the Ainu people, although the details of description are dubious from today's perspective. Since the end of World War Ⅱ, the Ainu people have been increasingly assimilated by the Japanese population and come to be regarded as a disappearing or extinct people. The Japanese Government for a long time continued to claim that Japan was a "mono-ethnic nation." However, due to activities primarily by the Ainu Association of Hokkaido, today's government view is that the Ainu people constitute an ethnic minority, a "people" with a language, culture and religion. Nevertheless, the Japanese Government has yet to recognize the Ainu as an "indigenous people" as defined by the United Nations. To overcome the violent history of Japanese-Ainu relations, it is essential to change the paradigm of the Japanese people and establish a "new partnership" with the Ainu people, based on the fact that people and groups identifying themselves as Ainu will continue to exist.